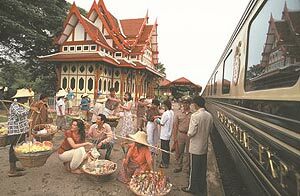 (Bangkok, Thailand) - The Eastern & Oriental Express (E & O) has long offered travelers the opportunity to experience the Golden Age of train travel through one of the world's most beautiful and exotic regions. This November, Orient-Express is introducing the Chronicles of Southeast Asia - four new journeys that enable guests on the E & O to experience the region in even greater depth. The new itineraries will take passengers in comfort to places off the beaten track and essentially turn the train into a touring hotel - a window onto the world of Southeast Asia. To ensure ultimate exclusivity and a more personalized experience, capacity on each trip will be limited to 60 guests and only presidential and state carriages will be in use. Epic Thailand (6 nights): Bangkok/Isan/Chiang Mai/Lampang/Bangkok. This journey visits sites in Northern Thailand - traveling from Bangkok to Chiang Mai and through fascinating, untouched landscapes. The huge diversity of Thailand is evident: remote settlements on the Isan plains; ancient temples that retain otherworldy beauty and tranquility; the culture-rich city of Chiang Mai and the Khao Yai National Park - home to wild elephants, gibbons, and fabulous birds. Highlights include: a walking tour through a traditional village in Isan; a sunset candlelight reception at Prasat Sikoraphum - a restored 12th- century Khmer Temple; Lunch with the first female Thai oenologist at Khao Yai Gran Monte Vineyard; The opportunity to participate in a Bai Sii (sacred thread) ceremony; Touring the town of Lampang "wild-west style" in a traditional pony trap. Fables of the Hills (6 nights): Singapore/Kuala Lumpur/Cameron Highlands (overnight)/Penang/Surat Thani/River Kwai/Bangkok. This tour takes visitors north from Singapore through the beautiful Cameron Highlands to Bangkok and highlights some of the best and most compelling parts of Asia: the colonial heritage of Malaysia's mist-shrouded Cameron Highlands, the historic Bridge over the River Kwai and the varied architecture of cities such as Kuala Lumpur, Kuala Kangsar and Georgetown on the island of Penang. Highlights include: Kuala Lumpur city tour, including a visit to "The School of Hard Knocks" (for the history and facts of pewter); Strawberry and tea tastings in the Cameron Highlands; Surat Thani Monkey Training College. Legends of the Peninsula (6 nights): Bangkok/River Kwai/Trang (overnight)/Penang/Kuala Lumpur/Singapore. From the city of Bangkok to the beaches of Trang on the crystalline Andaman Sea and the colonial architecture of Kuala Lumpur, this land voyage through Asia encourages guests to join in and do something new. Highlights include: The River Kwai Bridge; A sojourn at Trang that offers the chance to take part in a range of water sports; Dugong trekking; Thai cooking classes. Tales of Laos (3 nights): Bangkok/Pimai/Khao Yai/Vientiane/Bangkok. E & O passengers are among the few to travel this route. It is an evocative way to arrive in a country once part of old Indochina and subsequently sealed off from the rest of Asia for many years. Vientiane has a delightful old-world air, with traditional markets, golden temples and colonial residences lining leafy boulevards. Highlights include: Stopping at Phimai to explore the impressive Angkor-style Khmer temples; Discovering the vineyards of the scenic Khao Yai hills and sampling the "new" latitude wines cultivated there. Prices start at US $3,900. For more information and departure dates, please visit: http://www.orient-express.com/web/eoe/chronicles_asia.jsp.